One of my goals when building the printer was to be able to print nylon and other high temp materials. 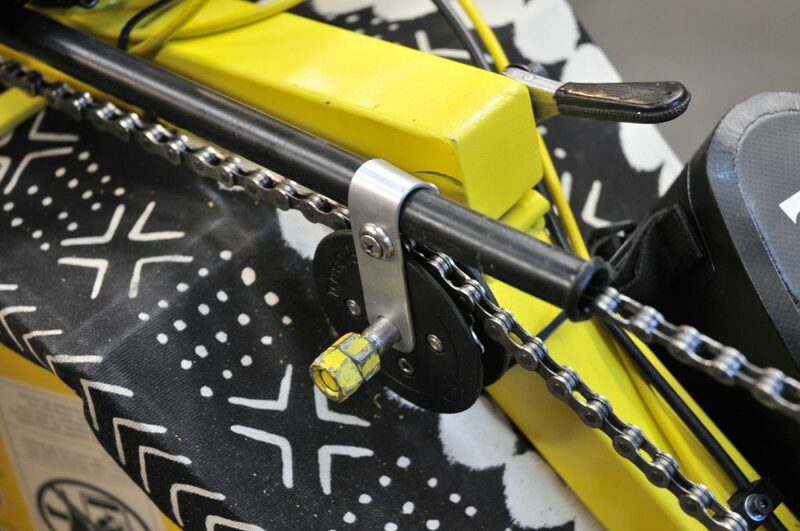 For the trike, I wanted to print some parts for the chain idlers in nylon. So I ordered some Taulman Bridge nylon filament in Black. This is supposed to be one of the easier nylon variants to print. Going into this I knew that getting the nylon to stick to the build plate can be tricky and it absorbs moisture from the air which will cause printing problems. The filament arrived, but it was repackaged, not on the original Taulman spool and keeper as shown on the Taulman website or on Amazon. It was vac bagged with no silica gel which was suspicious. I started printing at 255C with 60c bed temp on hairspray. Lots of popping noises (like Rice Krispies) and peeled up like a potato chip on the 3rd layer. Next, I tried Elmer’s wood worker’s glue. I had some left from past woodworking projects and it was getting thick. So I thought it was worth a try after seeing the PVA recommendation on the Taulman website. This sticks incredibly well!!! Actually hard to remove if you put the glue on too thick. Still lots of popping, puffs of steam and rough textured surface. increasing the temp to 265C helped only slightly. After the first night’s attempt I had placed it in a cat litter bucket with silica gel to try to dry t out. I had a few glossy areas (must have been down by the silica gel. So I had a clue I was on the right track despite a poor overall print. You only need a very thin coat of glue. If it is too thick, it peels off with the part. I was easily doing 6 parts per coating. Probably could do more if the location was not exactly the same each time. The next day, I baked the spool at 220F on convect for 5 hours . This made a huge difference. Now printing nicely with a glossy finish and no popping. The spool look a bit potato chippish however. It warped due to the heat. I am using a Hbot with Micron cobra extruder (all metal) and high flow 0.5mm nozzle. Printing @60mm/sec. I have not tried faster with the dry filament yet. Basically I am able to print at the same speed as PLA or ASA. The parts are side plates for chain idlers for my recumbent racing trike project. They are 80mm in diameter. 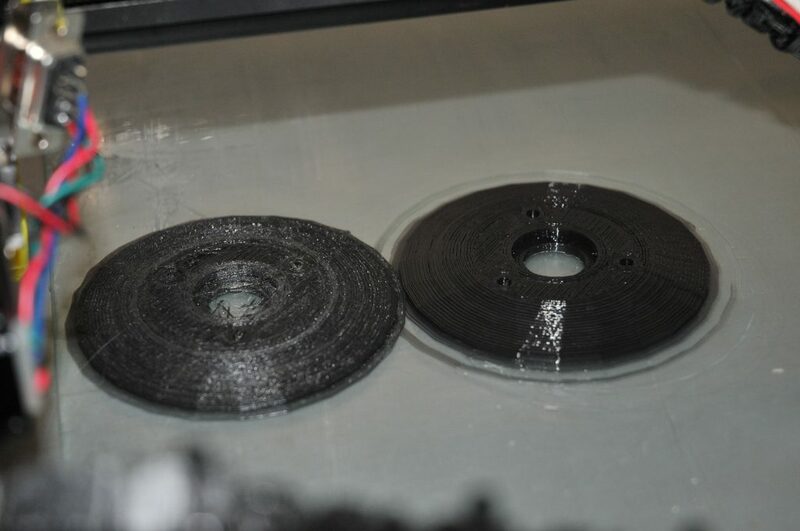 On the left is the “wet” version, right was made after drying the filament in the oven . Drying the filament made a huge improvement in the print quality. Without the drying I would have rated this filament a failure. 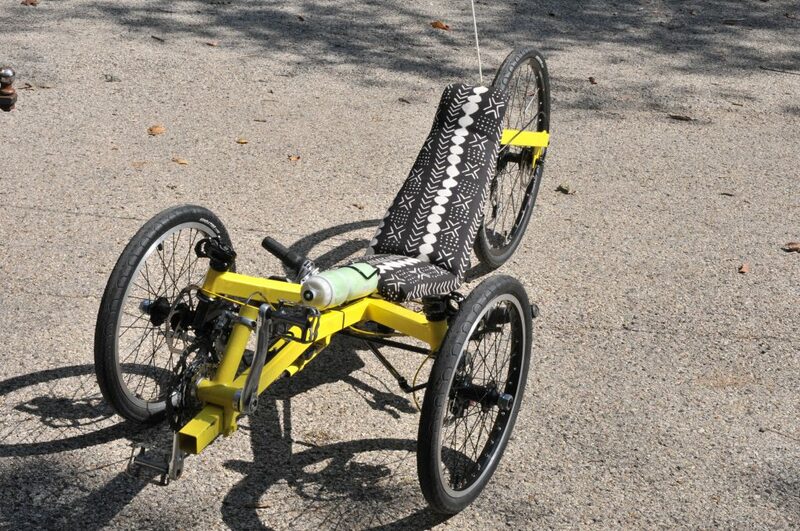 During testing of the idler concept the strength and durability of the nylon became evident. The chain was not restrained and kept bouncing off the idler gear, deforming the nylon flanges. The same tests with PLA shattered. I also need to leave a note on the printer as to which filament was left in the head at the end of a session. I have taken to cutting the filament off at the the top of the print head and letting it cool. This avoids the jams I had been having by pulling the filament out and leaving globs of filament in the feed tube. However the range of temps I am printing with is now quite large (nylon @ 255C down to PLA at 170C). So tonight I was tring to feed in the PLA for some frame tube end caps and had to remember to crank up the temp to clean out the nylon and purge, lowering the temp as the nylon was all fed out. 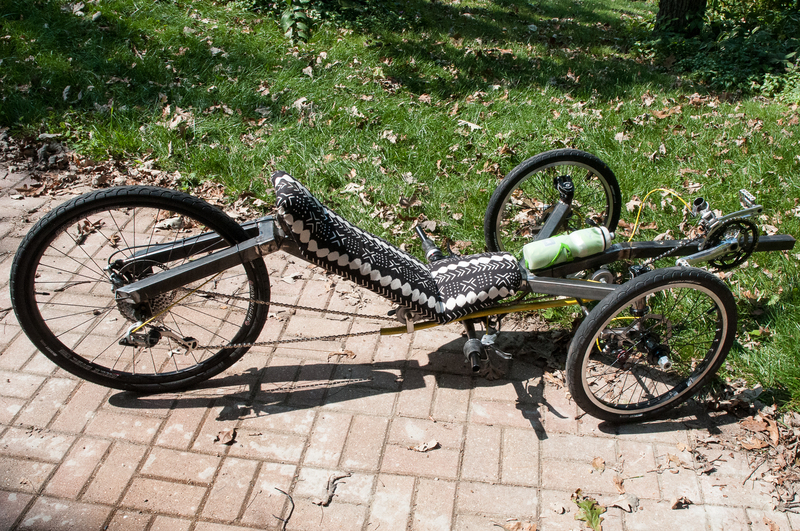 The trike is now mostly done, but the drive train was giving me grief. The idlers were not working out and I replace the rear cassette due to skipping. The previous owner of the components had beat the bike more than I initially thought with damage to the cassette and outer crank chain ring , both of which had to be replaced. Maybe there was a good reason he cracked his Trek carbon fiber frame? Metal pulleys as idlers . These were garden tractor style A size v-belt pulleys form Northern Tools. There were metal shavings everywhere and the chain would pop off. Hybrid pulleys. I used sprockets from the old gear cluster and 3D printed nylon sides and spacer to center them over the ball bearings. They held together, but after 5 miles were wobbling badly and the low gears were skipping. The chain would rock off the sprockets, ride on the sides or pop off all together. The nylon withstood a huge amount of force and merely deformed without breaking. However with a 9/32″ wide bearing, there was too much lateral force. Hybrid pulleys versions 2&3. I used PLA for the test models. However, it blew apart under stress in less than 3 miles. 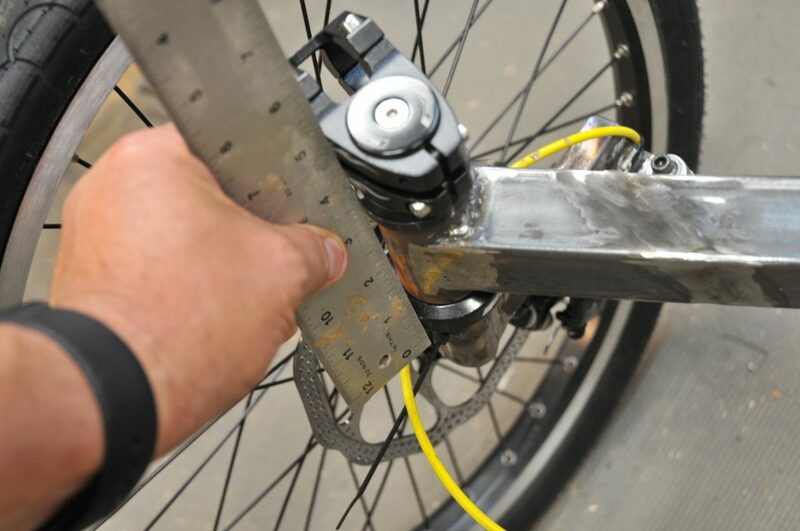 There were problems with geometry and the bearing to sprocket interface. I was not thrilled with the thought of making new parts out of aluminum to withstand the stress and support 2 bearings per pulley. Nylon flexed too much and I would have needed to bake the spool again due to the humidity. to drive off the absorbed moisture prior to printing. I then again turned to Google. This lead to Terra Cycle idler pulleys. http://t-cycle.com/idlers-chain-management-c-41/idlers-c-41_9/sport-power-idler-p-134.html They were highly recommended on the AZ website and elsewhere. I ordered a couple of these and one of thier 28″ chain tubes as an upgrade from the garden hose. 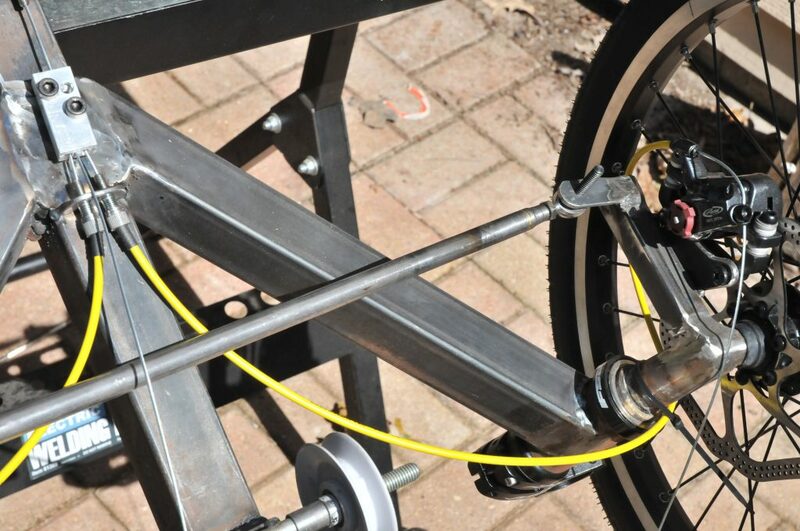 With the research, I also decided to redo the chain tube supports and let the sprockets and chain tube slide freely on the shaft rather than being held side to side in a fixed location. The resulting setup is seen below. I used 1/16″ x 3/4″ aluminum stock and bent it to match the chain tube. This was easier to make and the integral chain retention is a huge benefit. You can also see above, that when the old front idler shattered, the chain was then rubbing on the underside of the handlebars. With these installed, I dressed for cycling (cycle shorts, not my regular cargo shorts) so as not to appear to be flashing the passersby. The padding of the cycling shorts was not necessary but the snug fit was. I then did an intermediate length “shake down” ride. Just shy of 20 miles and nothing fell off or bound up. I still need to do some derailleur adjustment (some skipping under hard stress) and front brake fiddling (some squeaking/ rubbing of he disks) and front wheel toe-in adjustment as well as tying down the right front brake cable which is rubbing my calf. However, it rode very well overall. It was comfortable and fun. There were plenty of interested looks on the bike trail, as you might expect. Max speed was 26 MPH and average was 12. Still below my road bike, but I hope with a bit more tuning and remembering to top off the tires, I should break even. My back, wrists and hands felt much better than on the road bike. Conversely, my shoulders and biceps were a bit stretched as my hands are below and behind my back due to the reach for the handlebars. Legs were pretty good, but my shins are a bit sore tonight. I expect that there will be some “human break in” for the new riding position. 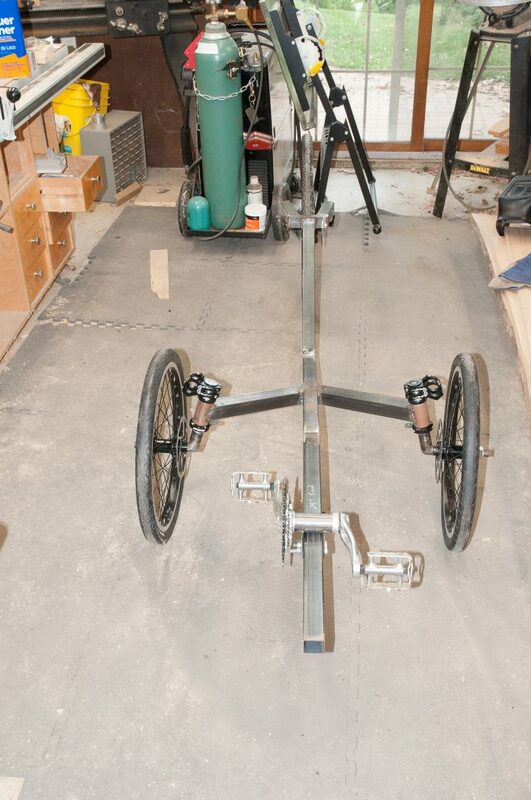 So now I have striped the trike back down to the frame. There was more touch up welding and grinding going on. The Atomic Zombie website motto seems to be “weld, cuss, grind, repeat” and it fit my welding skill level. So after things got close, I fixed any questionable spots that appeared and finished at 80 grit with a flap disk. Then I got out the Bondo to fill the last gaps, divots and make the fillets pretty. This took a few coats not counting the one where I mixed in spot putty rather than hardener (same size tubes and color – darn). So I also had to clean off the non-curing mix with lots of acetone and paper towels. Then after recoating with a proper mix, it was more sanding filing and then priming. The fillets all look nice now and errant grinder marks have disappeared. 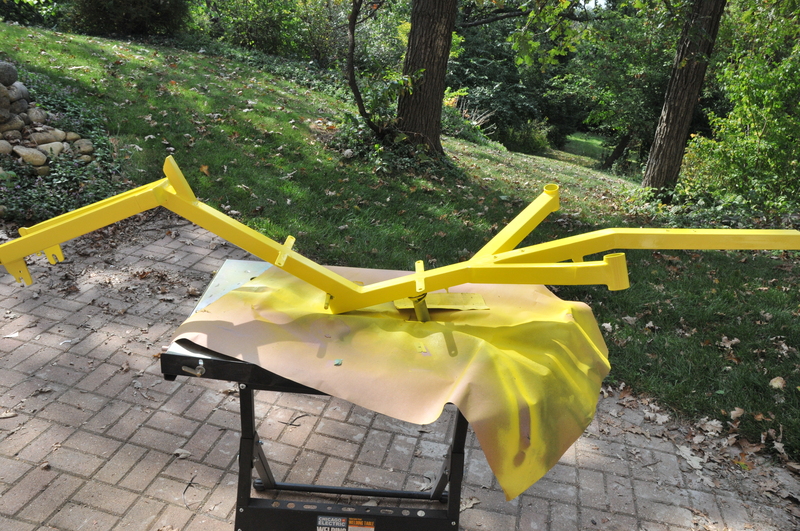 For the paint, I used Rustoleum self-etching primer and the color coats were Rustoleum Professional High Visibility Yellow. 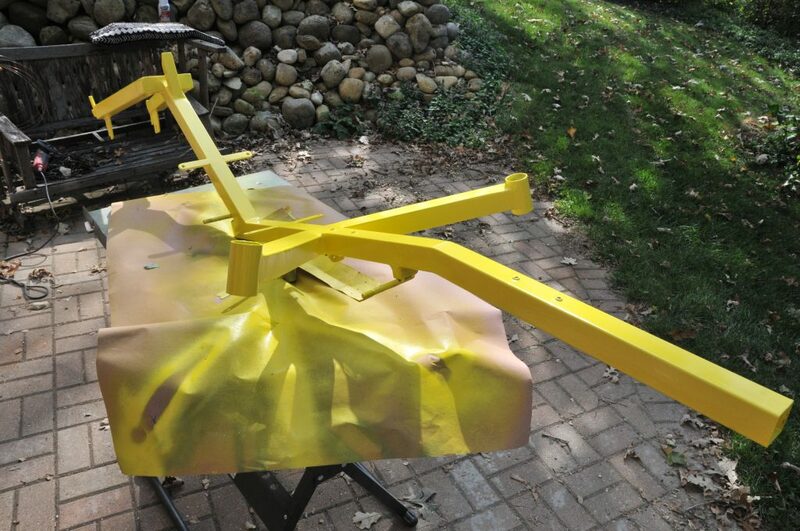 While a 2 part auto paint or powder coating would be more durable, this paint combination has served me very well on multiple machine tool builds and rebuilds (14″ Radial arm saw, Southbend 13″ lathe, Bridgeport Mill and the CNC router). Undercarriage parts were painted Gloss black for contrast. Unfortunately a week later it is still rather soft and scratching during assembly. This paint has a less <1 & >48 hour recoat window. I can generally push this to < 3 hours but at 12-18 you will definitely get blistering much of the time. So the painting was done on a weekend where I had a full day available for prep, prime and paint. I had some business travel scheduled so this forced a week to allow the paint to harden fully. Plus I was getting started on the new idler pulley design. The original pulleys from Northern tool are a bit narrow and wearing badly. So I will make some similar to what you can buy from TerraCycle for a fraction of the cost using spare gears and 3D printed parts. The steering pulling to the right bothered me. The 1.5 to 2 degree difference in the caster angles was there and it had to be the clue I needed. 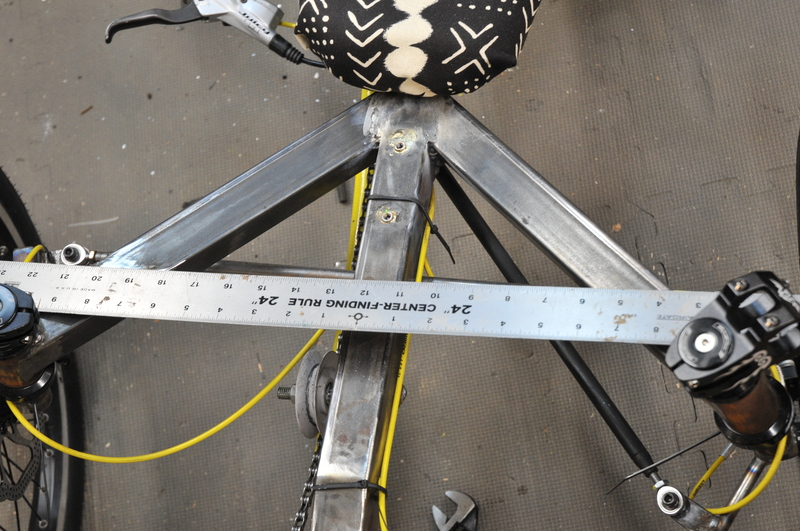 However, the angle readings were varying on each try but overall the right wheel had less caster than the left. I really did not want to cut off the arm and realign the whole thing again as that was not easy the first time. Searching at lunch for caster steering problems, I came across a Quora post that said if the caster is uneven the car will pull towards the side with less caster. https://www.quora.com/How-caster-angle-affects-to-the-vehicle-dynamics. This was the answer I needed! So, I decided to cut the front tube perpendicular to the long axis. This would give me the ability to adjust the caster without messing up the camber. WIth a 2 degree angle error and 1.5″ tubing I would need to have a slot 0.078″ or just over 1/16″ . One slice with a cut-off blade in the angle grinder would be about right. 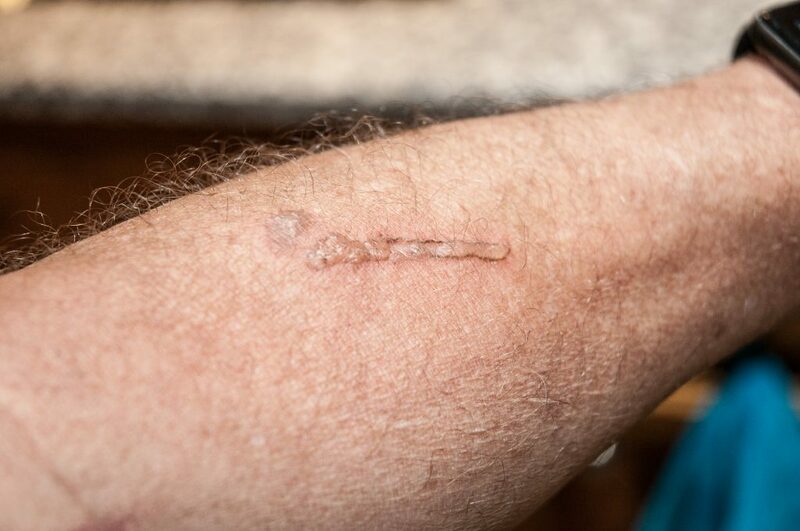 I placed a straight edge against the back of the spindle tubes and marked across the arm. Measuring the angle exactly is very hard. So I enlisted my wife’s help and used a pair of 2 foot long winding sticks placed against the front edges of the steering bearing cups. Sighting along these from the side I could see the angles were plainly different. Winding sticks are used in woodworking when flattening benches, aligning jointer beds and other areas where you are looking remove twist in a surface. Below, I am holding a ruler in the position where each of the winding sticks was placed. After slicing through the top and then the sides, a bit of downward pressure closed the gap. A quick check with the winding sticks again showed that they were now almost exactly parallel – the difference was gone! Now it was time for a couple of hot tack welds and a test ride. You can see the gap at the bottom, where the cut is folded and that it is tight at the top. This did the trick. I can now go 100-200 feet hands free with very little drift. I will still tighten up the steering a bit to add some friction as bumps will cause a deviation (yes more caster would probably help but I am going to leave this one alone now. 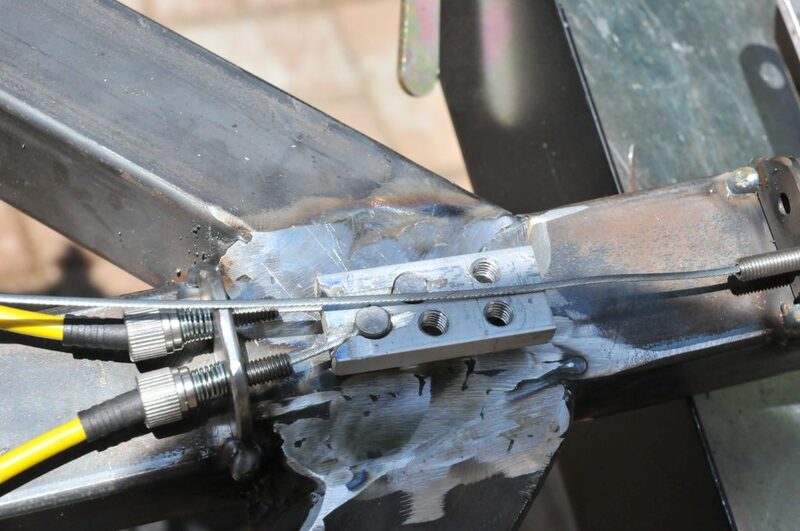 So it was now time to weld over the length of the joint and start to grind flush. It gets dark early now so I was not able to completely finish and it will be easier when the bike is disassembled for painting. The front derailleur needs a tube on which to mount. This ended up being a piece of water pipe that was bored out to a reasonable wall thickness. 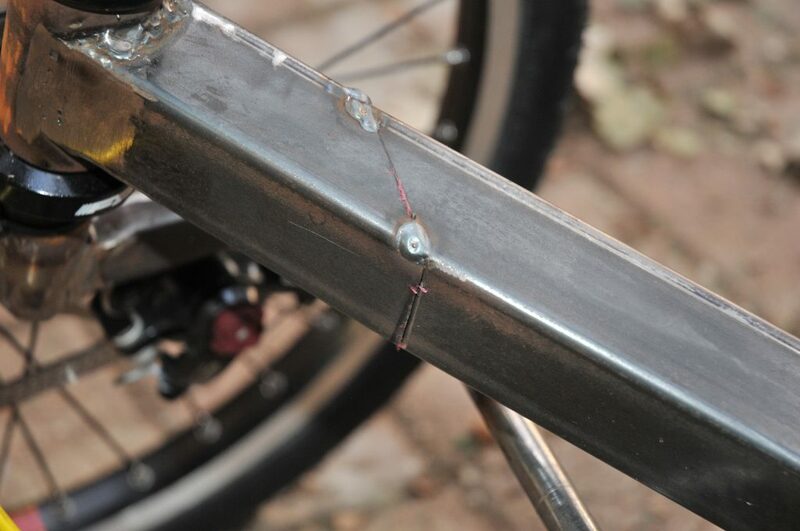 The pipe was then tacked in place on the bottom bracket as the derailleur range of motion was tested prior to final welding. 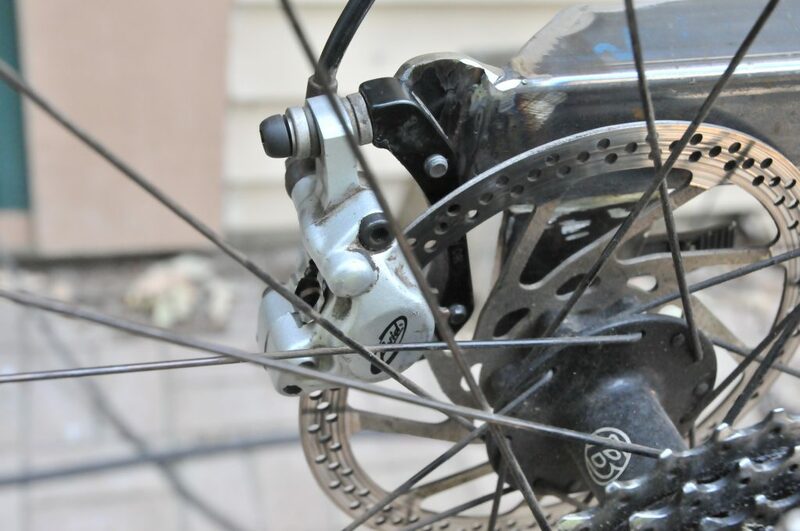 The used front derailleur is a top pull design. So in order to not have an excessively long mounting tube a special bracket was made to support the cable end. It is made from a piece of steel flat stock and a cable end braze on piece. The braze on piece was brazed into the bracket and the whole thing welded on with some intermediate test fitting. Afterwards, I flipped the trike back up on the buckets for more work. However it was a bit too soon and I am a bit too clumsy, so the bracket branded my left arm. This is what it looks like a day later. 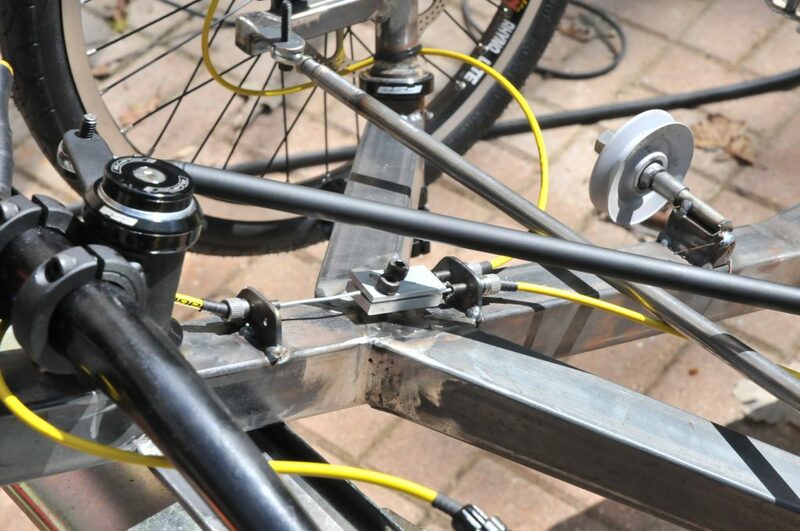 You can also see one of the sets of water bottle mounts in the photo of the crank assembly. These were more braze on bits. They require a 1/4″ hole in the tubing and are an M5 thread. The next pieces were a rear mount for the tail light and adding the parking brake. The parking brake, seen below, was a down tube mount gear shifter in its previous life on my dad’s old bike. It was trimmed down and brazed onto the frame under the seat. It still needs a dip in rust remover and a new cable but it works. So here is the nearly finished trike. Ready for test rides, body work (more grinding and some filler) and painting. Ready for the next test ride (minus helmet). One water bottle mount (stolen from my road bike) in place. There is still tuning required. The front derailleur does not like to shift onto the lowest gear and the rear skips when I pedal hard. I don’t know if it is an adjustment issue or that the used gear cluster is too worn. 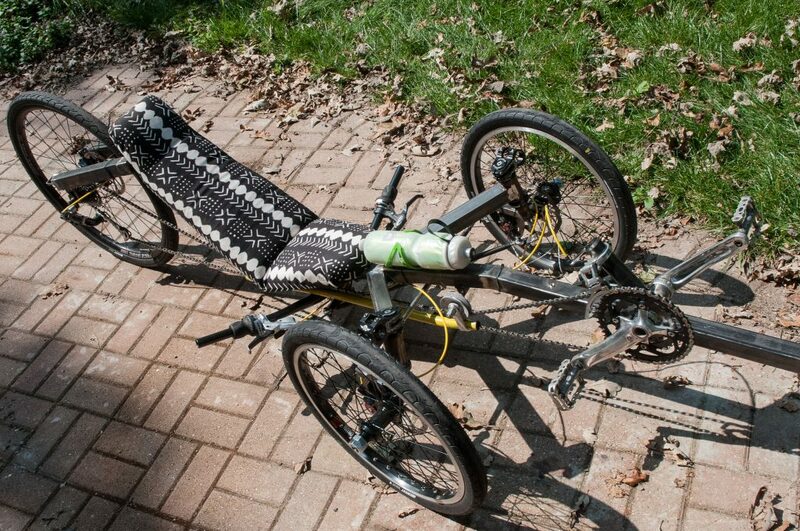 With the recumbent, there can be a lot more torque applied than when upright. I can make it up the driveway, but the speed is limited by rear gear skipping (darn). The top speed riding around our neighborhood so far is 23 mph. Not great, but not horrible either. The trike tends to pull a little to the right when hands free. I will probably add a tiny bit of friction in the steering linkage somewhere to account for this. I really don’t want to cut off the right front wheel arm and tilt it a few more degrees to add more caster. I see 9 degrees forward on the right vs the 10.5 on the left as best I can measure. Now it is time to tear it down, cut down the front rail tube, do some body work and paint it. 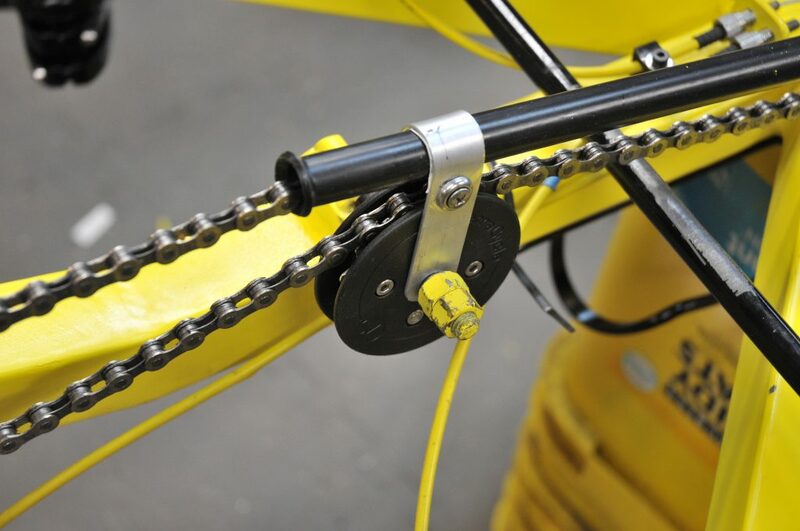 There are also some parts to 3D print, including new chain idlers. The Northern Tool idler pulleys are too narrow and generating lots of metal shavings on the chain and I am sure excess friction as well. Hmmm, One brake lever and two front brakes. This needs a bit of work. I considered the dual brake line brake levers, but they don’t look exceptionally well made. I also considered dual hydraulic brakes, but I would still be stuck with the original piston in the grip and reduced braking power. 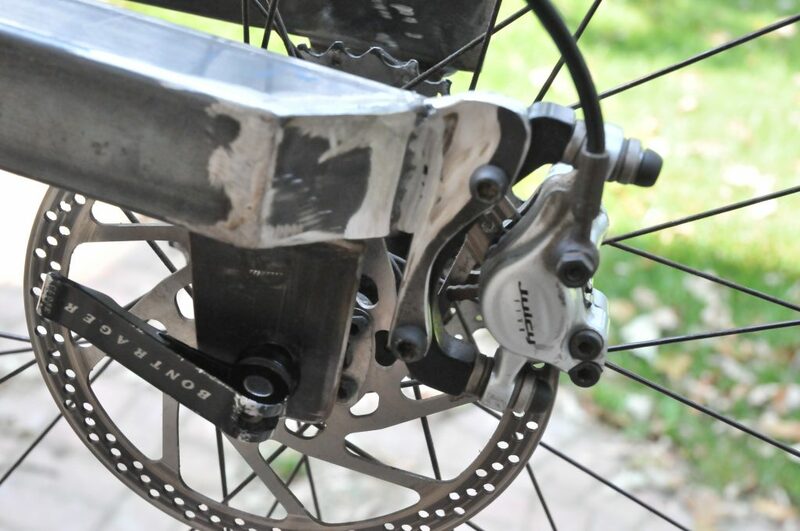 Using caliper brakes linked together was rejected mostly due to structural issues (long support arm for the brake). This left taking good mechanical disk brakes and linking them together. So, I settled on a new set of Avid BB-7s and 160mm rotors. 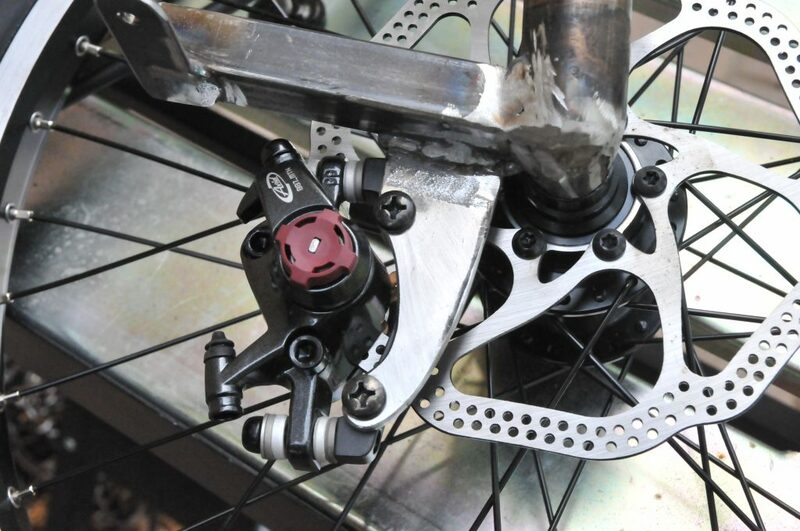 Looking over photos from the web I saw a variety of ways of linking up the brakes that were either needed some aesthetic help (big assembly on the handlebar), were mechanically unsound ( lever system with then unequal pull on the 2 brakes) or overly bulky. So I settled on a system where I would use an aluminum block to attach the 4 brake cables : two to the brakes, one to the handlebar and one reserved for the yet uncompleted parking brake. In the photo below you can see the bottom section of the block. It is made form 3/4 x 1/4″ aluminum stock. The holes for the brake cables on the left are drilled 7mm in diameter and he grooves were cut with a slitting saw, although the band saw or hacksaw would have worked as well. You can see that the exits are a bit too close together. I made the bracket before the adjusters arrived and the closest they can be set is about 12mm / 1/2″ on center. So the holes and slots should be a bit further apart to minimize friction on the cable entry to the adjusters. Here is the view from underneath the frame. The “combiner block” assembly is really not visible from above. Now it was time to add the cover plate. This serves 2 functions: retaint the outbound brake cables and clamp the inbound ones from the handlebar and future parking brake. You may ask how it retains the outbound cables? This is due to the slots not being cut all of the way through. The “dumbells” on the ends of the cable drop into the, holes after a bit of filing, but are prevented from falling through by the slots for the cable only being about 2/3 of the way through the block. Next was getting the brake line sleeves properly run and not rubbing on anything. I had to turn down the heads of the screws to get the 2 to fit next to each other. You do need all 3 for clamping pressure. 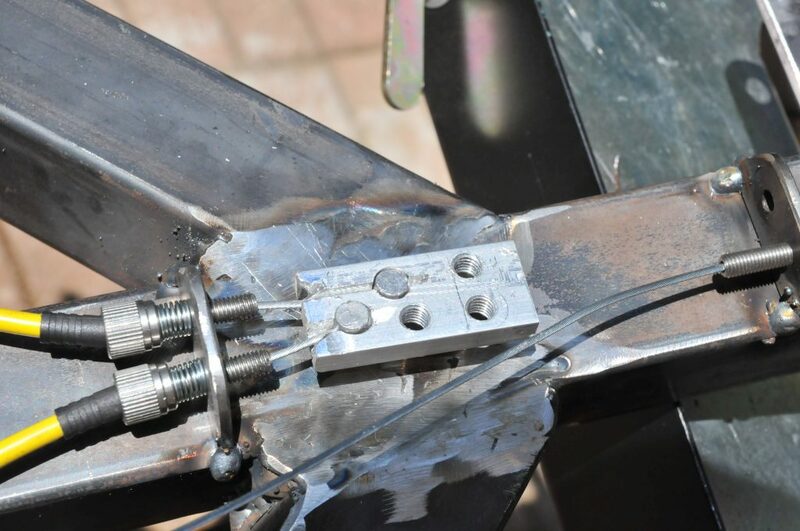 The long bolts for the chain idlers were trimmed off and the spot welds made firm. After this the chain was run and the inelegant but practical garden hose return run was mounted. The chain run actually takes nearly 3 full chain lengths to cover the distance. I used SRAM PC971 chains for this (at $20 a pop)! I mounted the chain and set the length per the Sheldon Brown recommendations. The front derailleur is not yet mounted, so I will need to see if I truly have enough take up for the lower gears. However at this point I should only need to shorten the chain rather than lengthen it and I was using a used chain for the 3rd one, so if it ends up looking like confetti, so be it. With steering, brakes and propulsion hooked up it was time for some test drives. I double checked the brakes and steering connections and was ready to set off down the driveway (which is steep) and for a cruise around the neighborhood. 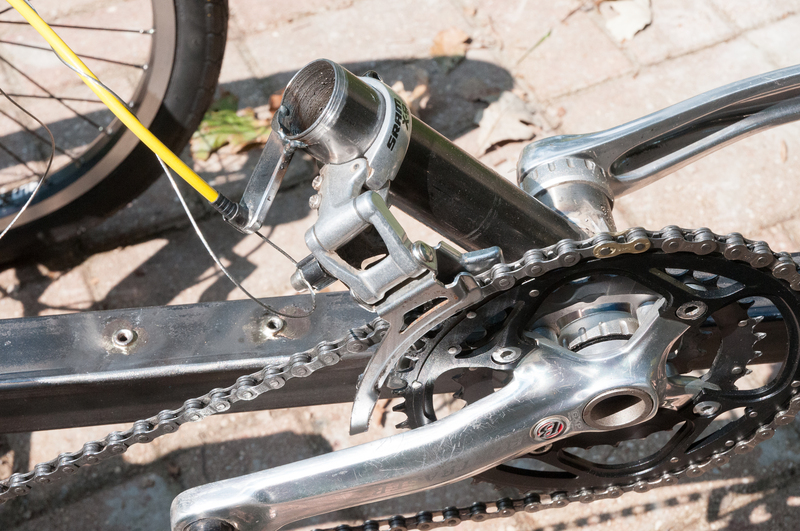 The shifting was not perfect and I nearly got hung up in high gear – yes I should have set the derailleur end stops. I was riding around the neighborhood at a nice clip, looking ahead and I became thankful that I was wearing underwear otherwise the neighbors would have had quite a show with my shorts billowing upwards in the breeze (not a problem on a regular bike). The handlebars were not quite tight and I got them set to a comfortable. On the way back, I was dismayed that the pedal resistance was higher than expected. 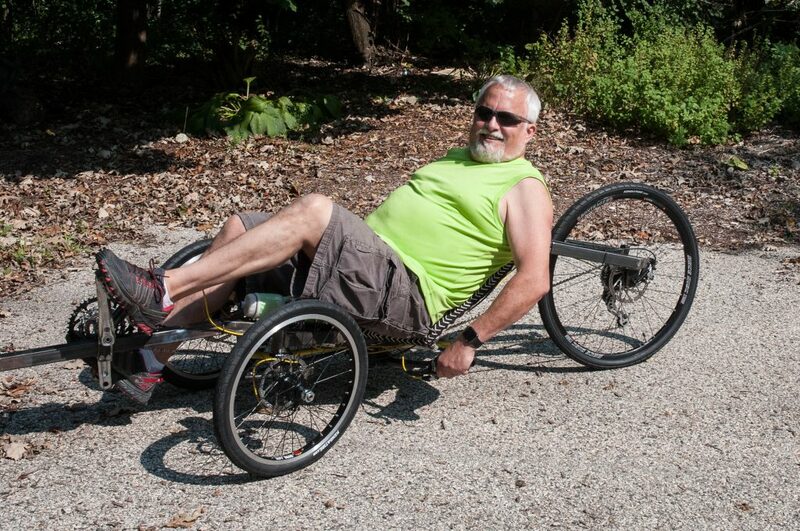 I then stopped at the bottom of the driveway and pushed the trike up – remember I have no low gears without a front derailleur and on my road bike I am normally in gear 1-3 on the way up. At the top I tighten the handlebars and notice the front wheel hub nuts are loose. No wonder the resistance increased and thankfully it must be pretty hard to lose a front wheel with disk brakes. So I tightened the hub nuts and added the jam nuts. I also fiddled with the toe in of the front wheels to minimize the steering twitchiness I had been feeling. Now it was time for another test. This time speeds were up and steering settled out. Now it was time for the kids to come over for Labor Day dinner and I had prepared another big batch of smoked chicken. After dinner it was my son David’s turn to try the trike. He took it on the same route, and came back with a big smile and started up the driveway (remember I said it has no low gears). He gave it a valiant effort and made it half way up. Now he was stuck. Cnt go forward, and really can’t get off either, for as soon as he lets go of the brake to swing his body up forward to get off, the trike slides back down the driveway (hence the need for the yet unfinished parking brake). So rather than risk having a father-less grand-daughter, I go to rescue him and prop my leg behind the trike while he gets off . All in all, it is a success so far, but there is still more work and fine tuning to go. Looking at the upturned handlebars in the plans and the comments about twist grip shifters being hard to use, I was not surprised. You would naturally grip these thumbs up. You have to grip the shifter with your 2 smallest fingers against your palms. Poor grip and leverage. Below is the photo of the handlebars from the Warrior plans. I want to do a flatter arrangement so that I can reach down and have my thumbs toward the center rail and a normal arrangement of the brake lever and twist grip shifters. I had purchased an aluminum mountain bike handlebar, but it did not turn up far enough for my liking. 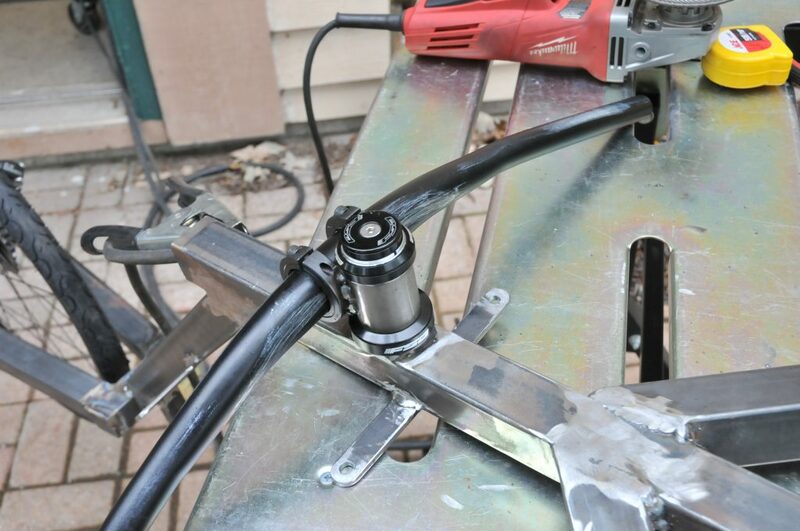 So it made a number of passes through the Harbor Freight roller tubing bender and ended up in a decent upwards arc. It was a bit tough at first to keep it from turning as it went through, but then shallow grooves wore into the center section and it stayed centered. The rollers I used are for 1″ diameter tubing which matches the ends but he center is 30.8 mm (approx 1.25″). To make the pivot, I used another of the same bearing sets I used for the front wheels. The center post is fixed. The post is 1 1/8″ steel tube and has a step ring brazed on as I did for the wheel bearings. This was then tack welded to the frame for a test fit to see how it felt. The distance from the tail end of the rail is 7″ rather than the 10″ in the plans. After testing, I solidly welded it all the way around. The center section is 1.5″ OD steel tubing that is bored on the lathe to fit the bearing cups as before. To this, I welded 2 steel shaft collars. They held a piece of tubing while I did the welding to make the alignment right. The collars were a bit undersized for the handlebars (it would have been better to test fit BEFORE welding up the assembly). So I had to bore them out on the mill for a perfect fit. I placed some washers as shims between the halves before boring to make the opeing a bit elliptical for good clamping pressure. The soft Chinese steel bored easily. Here is the view from the underside. 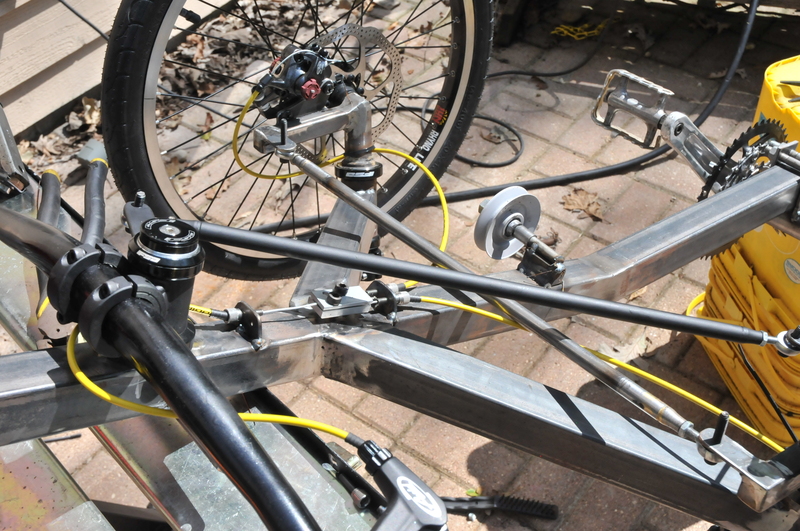 Next comes the linkage from the handlebars to the front wheels and hooking up the brakes. 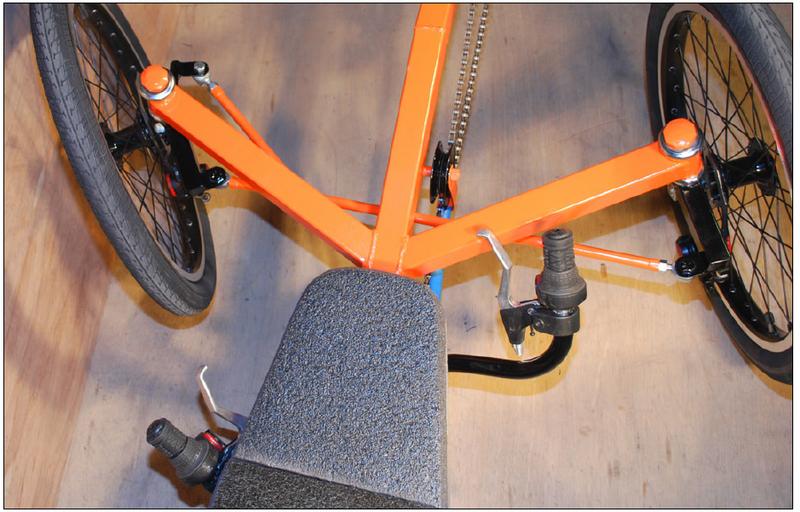 The trike is set up with disk brakes. The fronts are new Avid BB7 mechanical and the rear is a used Avid Juicy 5 hydraulic. All have 160mm rotors. 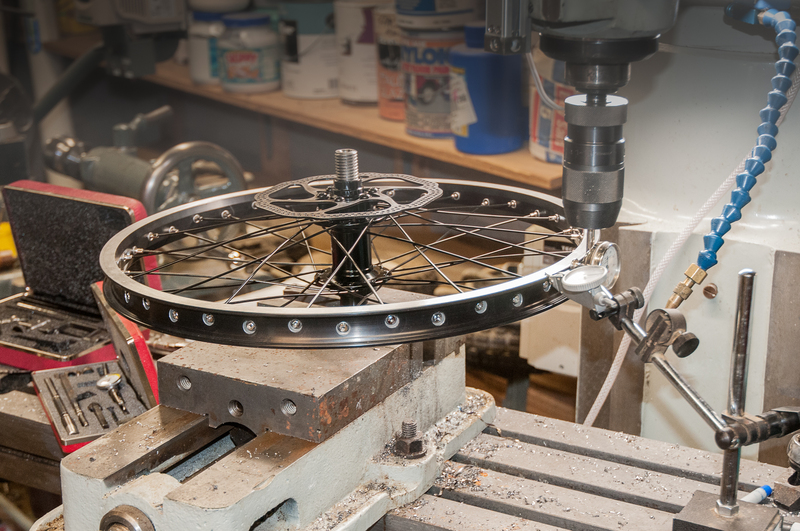 Mounting the brake assemblies requires fabricating some odd shaped pieces of steel to weld to the front wheel assembly and the rear fork. The easiest way to do this is to make templates from paperboard. 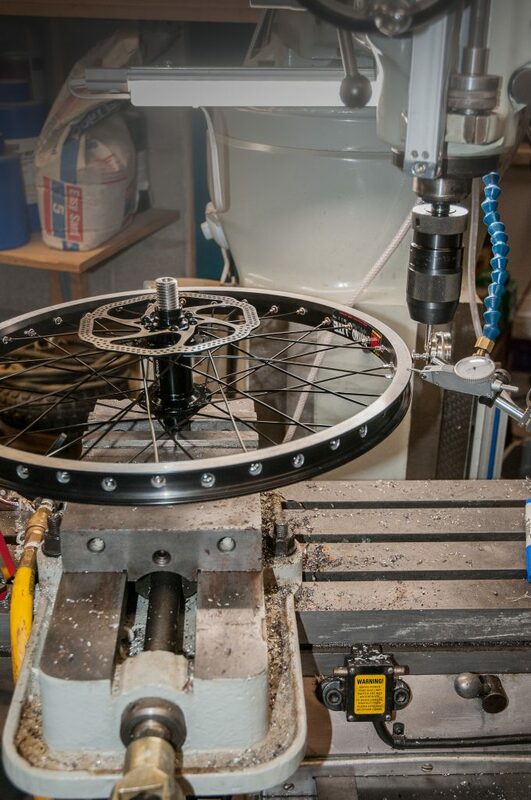 First the template is attached to the brake assembly and successively trimmed while fitting the brake on the rotor. Make sure that the brake is out far enough so it does not rub on the peaks of the non-round rotors. For the mechanical brakes you can adjust the pads to hold it in place, however this is sensitive to slightest movement of the bike. 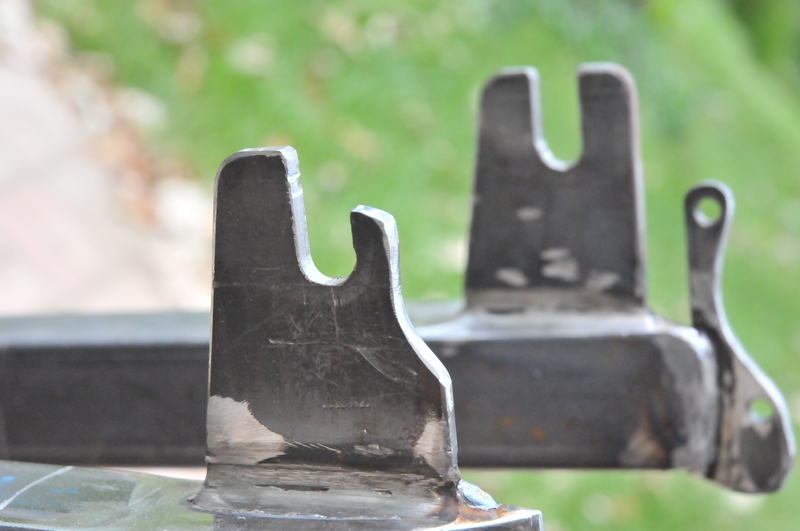 The mounting plates were cut from 3/6″ steel flat stock. My bandsaw has a 1/2 ” blade so the curves to a number of passes and a lot of grinding. The grinding was done on the bench grinder, some 1.5″ sanding drums and the combination belt / disk sander. The mounting holes are 6mm diameter. The next step was to modify the rear drop-out to fit the rear derailleur. The derailleur is a used long cage SRAM X-9. This involved quite a bit of grinding to fit the recess in the derailleur for the original bike drop-out. Comparing to the other side, you can see how much had to be removed. 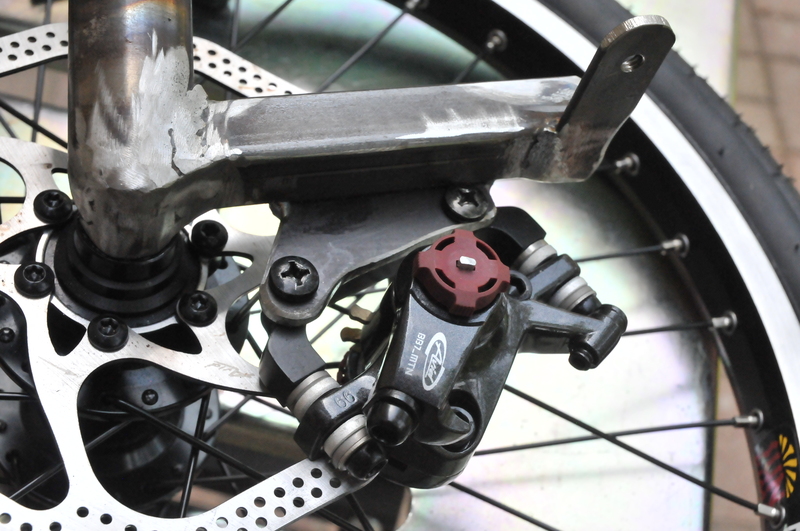 In the background, you can also see the profile of the rear brake mounting bracket. I still need to drill a hole and make a new bushing for the retaining bolt for the derailleur. (there is probably a more proper term for this, but I don’t know it). At this point it would fall off each time I remove the wheel. 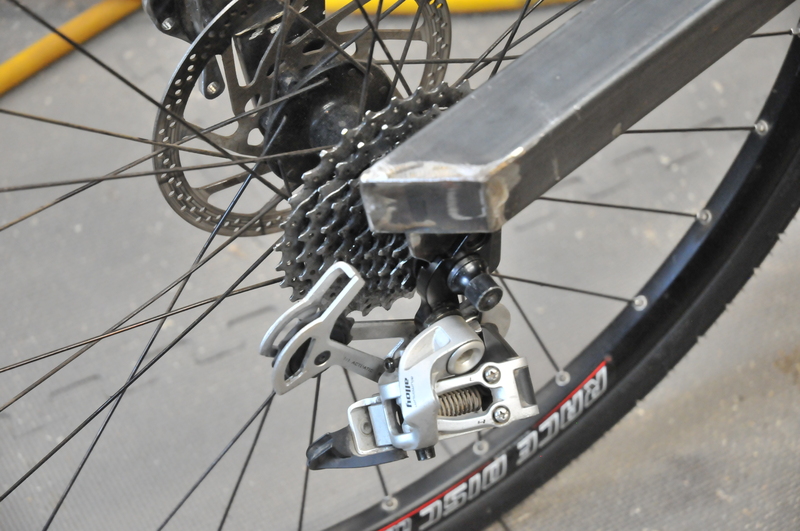 The derailleur travel still covers all of the sprockets when moved by hand. The seat needs to have mounting tabs to secure it to the frame. These are about 3″ long and I had the ends drilled with a 5/16″ hole. 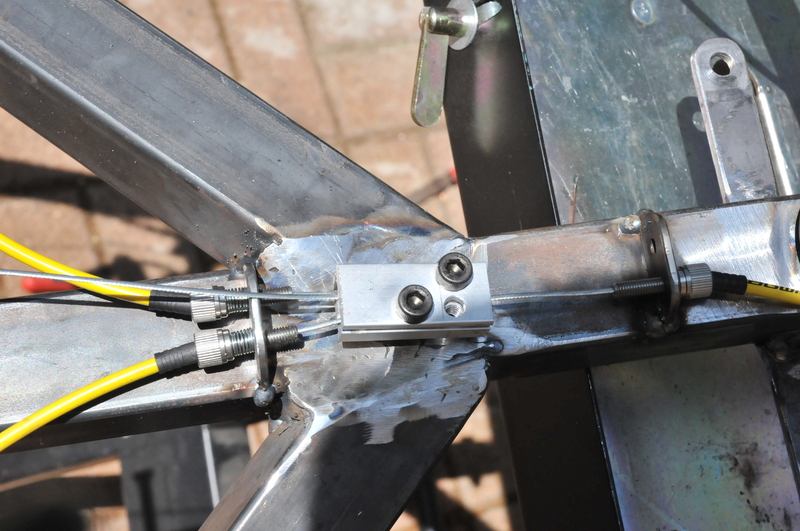 The brackets are welded to the frame and ground flush. The seat is placed on the completed brackets and the holes marked. The were then drilled for 1/4-20 T-nuts which are mounted from the top. This makes for a very secure mount. 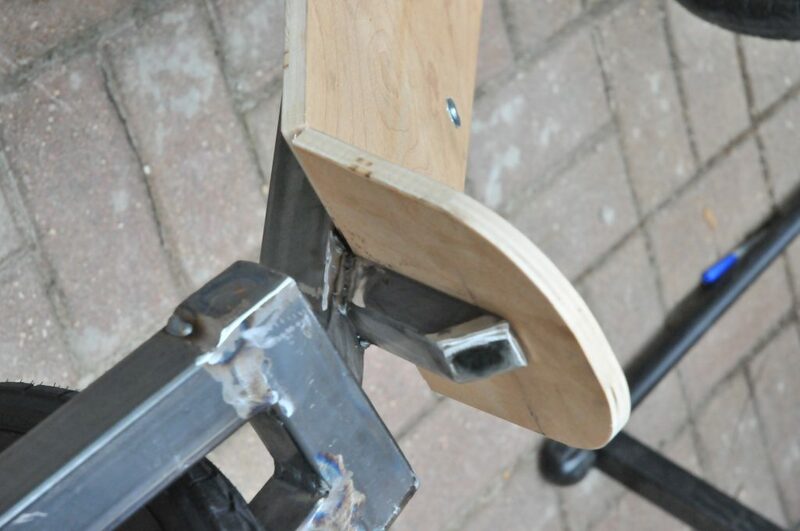 Once the seat is mounted then a small “backrest” bracket must be made form 1″ tubing and fitted. This an be seen below. 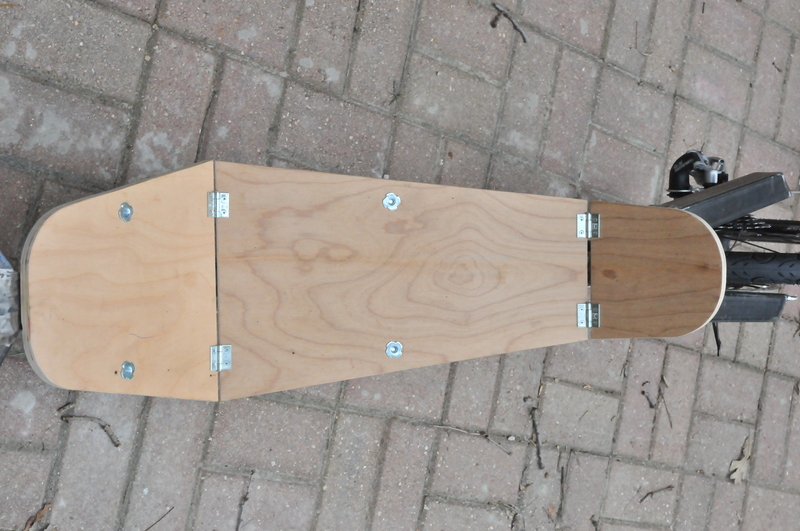 I had test fitted it, in the process of setting he angles and after tacking, but it seems a bit steep right now. It may be cut and adjusted after the padding is on the seat. In addition to these items I did a fair bit of weld grinding and clean up today as well. Overall, it was a productive day. 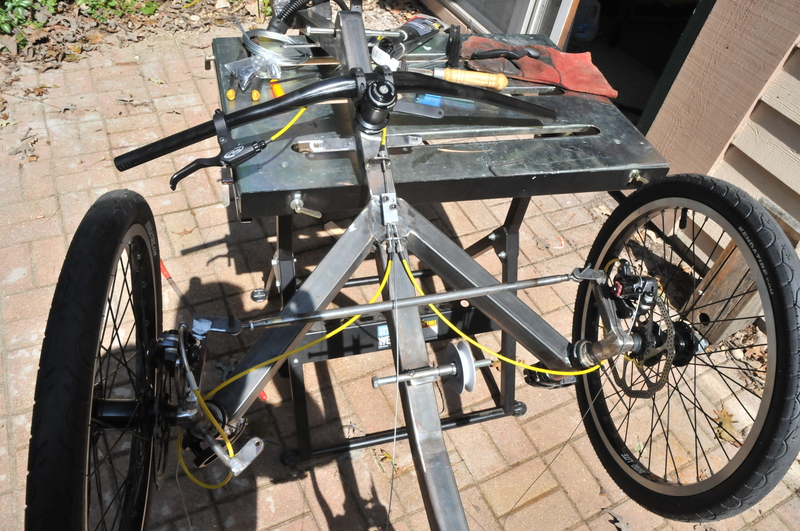 The fit-up and welding for the front wheels was the most taxing process in the build of the trike by far. 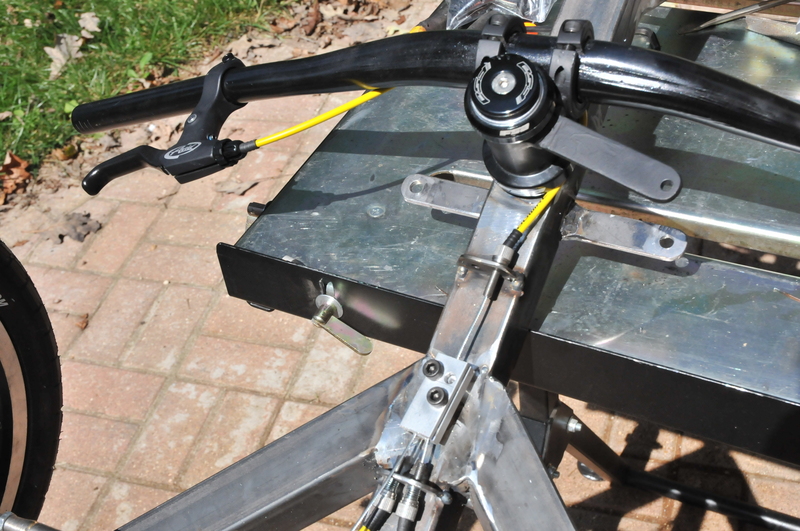 There are multiple factors to take into account when creating the front steering geometry. The pivot point for the front wheels should be under the contact patch of the wheels. For the axles I had made this meant that the steering tubes had to be at a 15.5 degree angle with respect to the plane of the wheel. If this was not enough, the same steering geometry had to lead the tire patch by about 10 degrees to make the wheels (caster) to naturally track. The instructions said to fit the steering tubes directly to the struts. 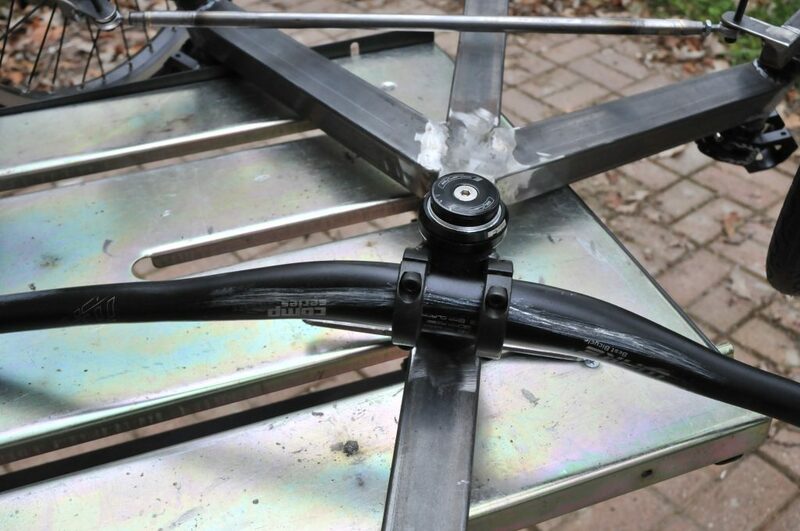 Then adjust the strut angles with the rest of the frame to get the correct geometry. I think the plan authors must have been rolling on the ground laughing at how much fun this would be. Problem 1: The tires need to pivot on the contact patch as you turn the front wheels. If this is mis-aligned you scrub of tire and lose cornering control. 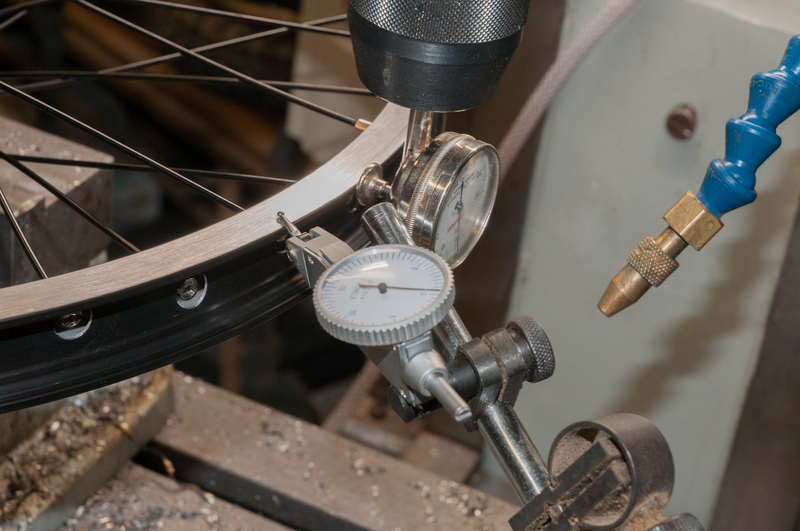 So, you need to fit the axle to the steering tube and held it in place at an obscure angle so that the projected line through the tube lands under the center of the contact patch of the tire. Check. 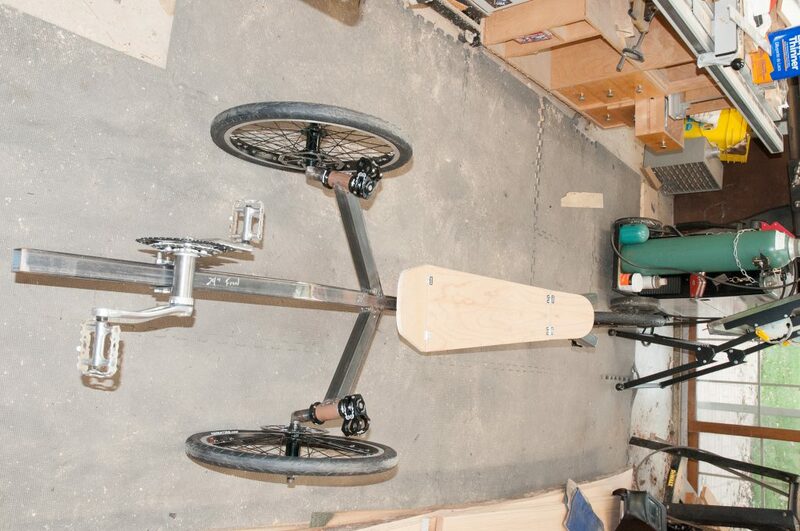 With my axle configuration and hubs this as about a 15.5 degree angle. 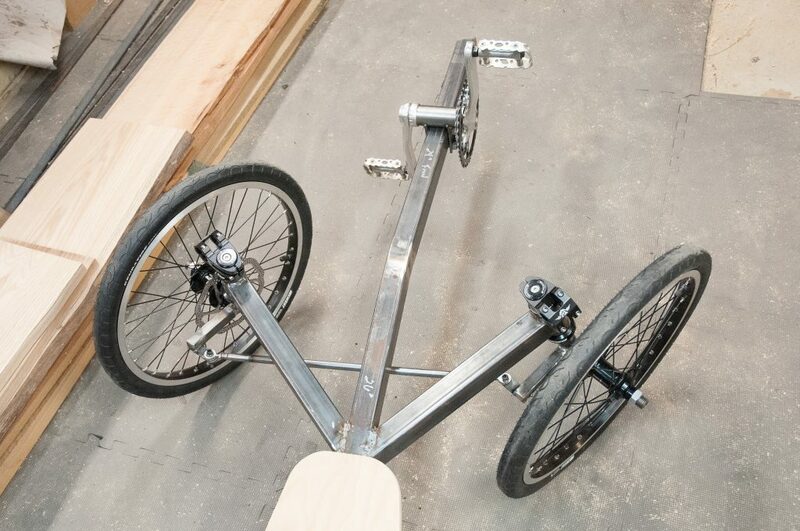 Problem 2: Now that the wheel can turn without scrubbing, you need to set the forward angle of the pivot such that the trike will track on its own. On a car, this is referred to as the Caster. Think of the fact that hands free steering is “really nice”. So how do you accomplish this? It requires that the steering tube be inclined at about 10 degrees forward such that the imaginary line through the tube lands in FRONT of the tire contact patch. The tire is then automatically following the steering direction and tracks nicely in the forward direction (not so much in reverse) . Eventually I ended up with a reasonable facsimile of the angles and arms that are needed and they even fit the bearings I had purchased. The FSA ” the PIG” bearings have so far worked out well (but I am still worrying about losing pieces). So now, I have front wheels for the trike. I have also tacked on the pieces to connect the wheels so they turn as a single unit. The Ackerman geometry seems to be working with the inside wheel turning more sharply than the outside wheel. However my testing in the shop is limited by available space. Next, will come the brakes and the rest of the steering components. 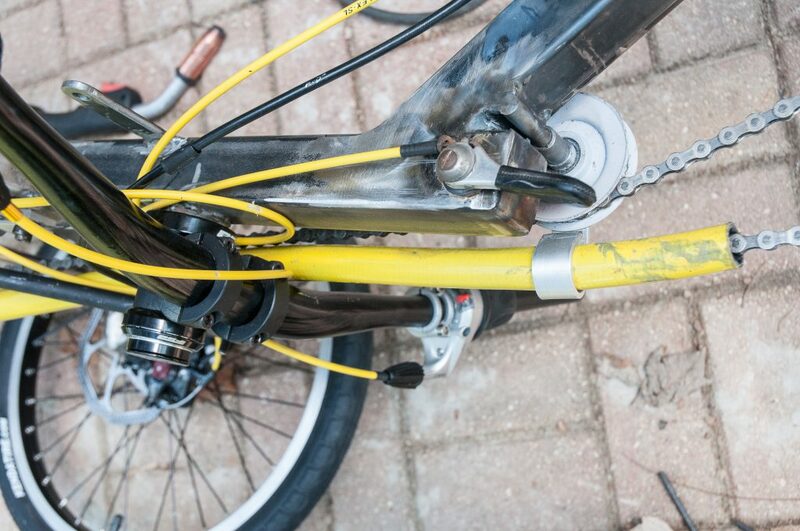 The wheels were laced up and the spokes initially tightened. The Atomic Zombie tutorial videos were great. 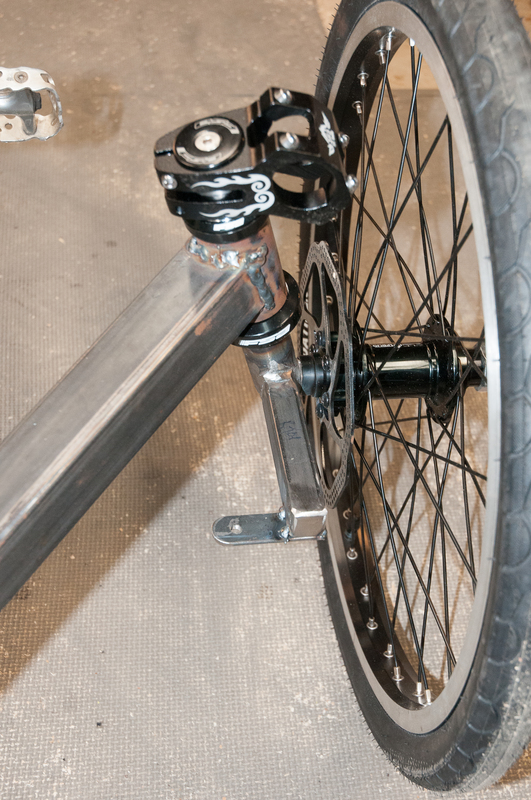 Plus Sheldon Brown’s wheelbuilding page yield more detail. The primary means of keep everything straight is simple turns counting. 4 turns initially, 2 , and then checking against a stationary reference. I did this on the desk by placing the wheel next to a soda can and spinning, using the can lettering as a reference in the vertical direction and rubbing against the side in the horizontal. 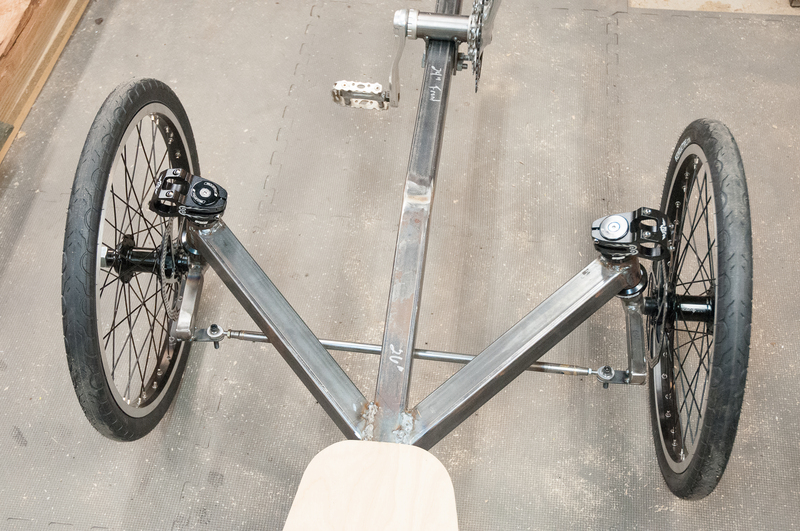 One of the keys in keeping the wheels straight is also in the stretching and seating of the spokes by grabbing groups of them and squeezing. After a while, tightening the spokes and tweaking the rim wobbles less and spokes sing when plucked. I don’t have a truing stand but I do have dial indicators and a large, rigid stationary reference – the Bridgeport mill! I mounted one of the axles in the vise. Then Placed the wheel on the axle . Next I positioned the test indicators, with on in the spindle chuck and another on a magnetic base on the table. The worst case run out was total 0.030 inch (0.7mm) as set by the soda can method. Final runout was less than 0.010 inch (.25mm). This should be close enough. I can re-tweak it later if necessary. Overall, it worked great for a simple kludge method without specialized single purpose tools. This would have worked nearly as well with a table saw, jointer table, welding table or reasonably large steel plate or I beam as the reference and a pair of dial indicators on magnetic bases, like the one I am using on the vertical direction. These are quite inexpensive ($30-40 each) when ordering from Grizzly, CDCO, Amazon or even Harbor Freight. The test indicators I used are a step up from the budget units, but the basic 1″ travel indicators would do just fine. The Starrett test indicator I am using was eBay find. Being able to adjust the spokes directly under the vertical dial indicator was quite convenient. The Mill and Lathe were both school shop drop outs. With the current lack of support for skilled trades, many schools have been dumping their machine tools and shop programs which is a travesty. The lathe came out of a Milwaukee high school (First Division?) and the mill came of Milwaukee Area Technical College. Both underwent multi-month complete rebuilds as they were moved into my basement shop. It is a joy to use real heavy weight tools. However it is a sometimes back breaking and tedious process to break them down to components and bring to the basement for cleaning, adjustment, painting and reassembly. These join other rebuilds such as my 14″ Radial Arm saw ,16″ Jointer and others that range from 50 -125 years old. Plus there are also scratch built tools such as the 4×5′ bed 3HP CNC router.